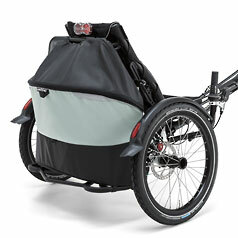 The KETTWIESEL CROSS STEPS: the delta trike for up and down and whoopee! 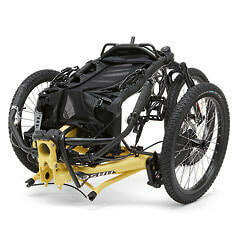 The recumbent all-terrain trike, the off-road delta, or the daredevil of the HASE BIKES family - this is the CROSS. The KETTWIESEL CROSS. The yellow bullet with the knobby treads sails serenely over roots and rocks, carves up the tightest corners, and keeps the squirrels watching safely from the trees. Be it off-road thrills in the forest or insane challenges at the bike park, one thing is clear: the fun-seeking CROSS has a nose for the road less traveled! Also typical KETTWIESEL: for riders with special needs and/or off-road genes, there are all kinds of special pedals and accessories! 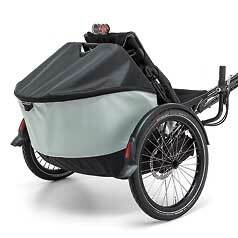 As a delta trike, the CROSS is also perfect for turning on a dime, parking upright, and hitching up for tandem fun. Bombing downhill, leaning into corners, testing your limits: this what the off-roader lives for, and good equipment is everything. The CROSS has an extremely sporty chassis and keeps its cool on the gnarliest stretches - thanks to the independent wheel suspension with sway bar and special air shocks. Bottoming on jump landings? Ouch. 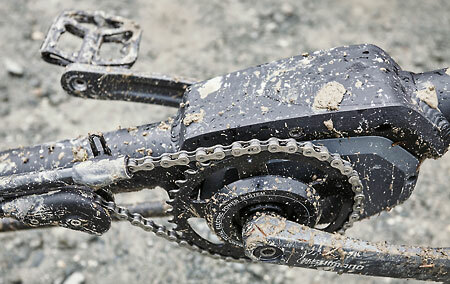 This is why we custom-developed our own HASE BIKES linear derailleur for the CROSS. 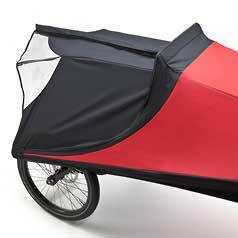 It has more ground clearance than standard derailleur cages. The 11-speed system made from CNC-machined aluminum is sophisticated, but not finicky. It's also very forgiving of shifting mistakes. Sound good? It's out of this world! Surrender to that steep, pebbly slope? 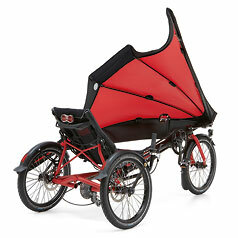 Not this trike! Every CROSS comes with a differential, which transmits power to both rear wheels. 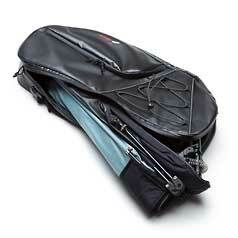 The tires almost never lose traction because, with a delta, the rider's weight is over the rear axle. Riders who can't or would rather not rely on pure muscle power can switch on the Shimano Steps mid-motor any time they need a little energy boost. The smooth and quiet system is seamlessly integrated into the bottom bracket and helps you rocket up the ascents. Sure, you can ride your CROSS over asphalt. But if that's not exciting enough, the station wagon will also take you and your CROSS from challenge to challenge. 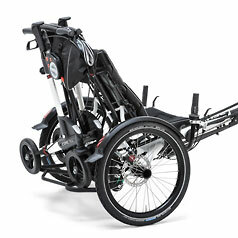 Thanks to the ingenious folding mechanism, three quick steps is all it takes to transform the trike into a compact unit measuring a maximum of 38 inches (96 cm) that fits easily into the trunk. Awesome, isn't it? 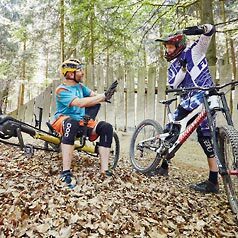 Bike parks: Warstein and Winterberg are hot. Cape Town is cool. Or is it the other way around? We found the ride through the Tokaj Forest amazing! And not just because of the palm trees. 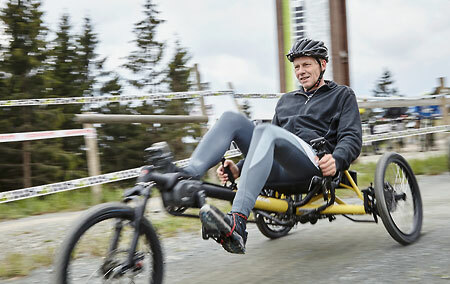 ​Mobility has always been an important topic for him: Gunther Belitz knows about special needs and adaptive bikes – also from personal experience. As an athlete, he loves challenges. This time, the challenge was: conquering the Winterberg bike park on a KETTWIESEL CROSS. Forty-eight degrees Fahrenheit (9°C), heavy rain, cold wind: this is the town of Winterberg in Germany’s Sauerland region on a Saturday in early June. “When we first arrived and I saw the steep, muddy course from up top – well, it was pretty intimidating,” admitted Gunther Belitz frankly. 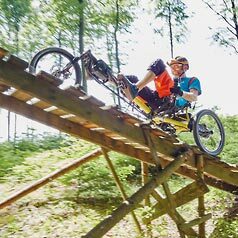 But the 52-year-old has never been one to shy away from athletic challenges: in the 80s and 90s, he was raking in the medals at the Paralympics, even at world-championship level. Belitz lost his left leg when he was a child. “I’ve always been a very active person, wanted to do all kinds of things,” he explained. “The classic wooden prosthesis was helpful for fouling in soccer, but I definitely wasn’t the fastest kid on the field.” Back then, he felt poorly advised when it came to assistive devices. “Isn’t there anything better?” he asked. The technicians said no. But then sometime in the mid-80s the carbon-fiber prosthetic leg hit the market, and his success story started – Belitz was one of the first to run with the new device. In 1992, he broke the world record in long jump. Inspired by his own experiences, the professional journalist took over the German ­magazine Handicap. 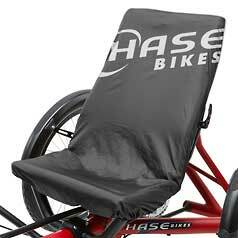 “I wanted to offer people who are dependent on assistive devices the same guidance that magazines like Auto, Motor und Sport offer car drivers,” he said. A unique concept for the 90s: testing wheelchairs and prostheses. 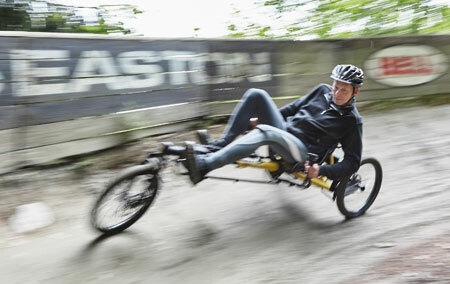 But today, the journalist had come to try out HASE BIKES’ sporty delta trike – with one wheel in front and two in back. Wide, knobby tires with plenty of grip, a chassis that keeps its composure even at higher speeds, and a suspension system that absorbs everything the trail can dish out. 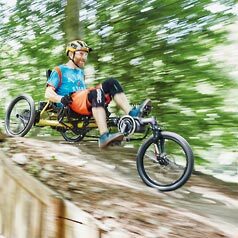 “The winding route with banked curves certainly seemed daunting at first,” said Belitz, “but after the first few meters, I knew that I could easily keep the trike under control. The SUV look is no gimmick. Its off-road performance is authentic!” As is the exhilarating ride. 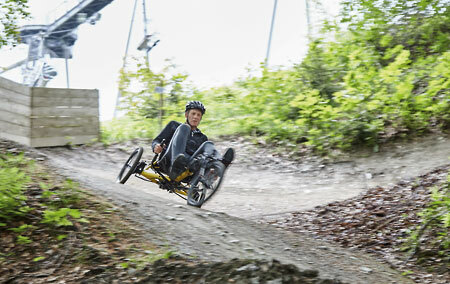 The bike-park test not only convinced the Handicap chief editor of the KETTWIESEL CROSS’s off-road capabilities: it also demonstrated what a wide margin of safety the trike has on “normal” forest paths or bumpy roads. “It sticks to the curves like crazy glue,” said our tester after the second run. 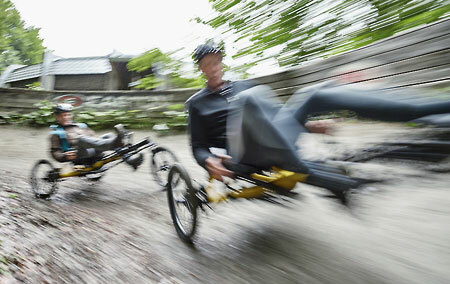 ​Not even the hostile lift attendant, who had apparently never seen a trike before and didn’t want to send our vehicles to the top, could dampen the buoyant mood for long. But then again, who needs lifts when you’ve got a KETTWIESEL CROSS with powerful Shimano STEPS motor to get you up the hill? Once Belitz was back in the CROSS, plunging down the winding descent with us photographing him in action, it was smiles – and thrills – all around.